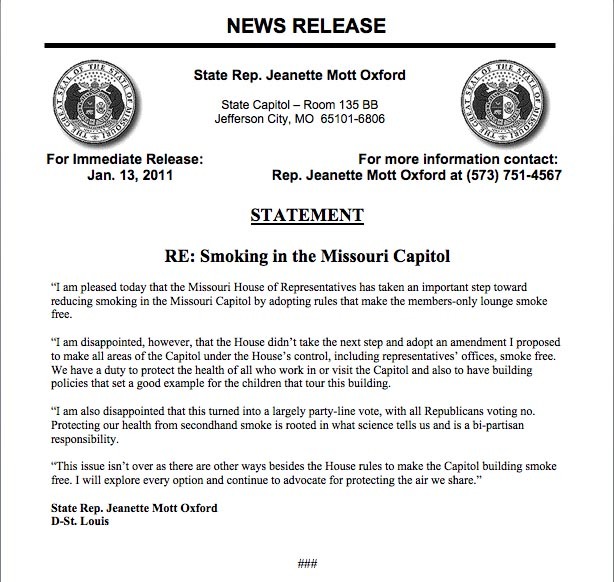 Thursday, January 13, 2011 Missouri GASP [Group Against Smoking Pollution] Inc.
Rep. Jeanette Mott Oxford’s proposed amendment to the House Rules to make the entire House side of the State Capitol smoke-free just came to a vote. It lost when the Republican majority voted unanimously to oppose it. That was a huge missed opportunity. Before this vote the House Rules Committee had agreed to make the Member’s Lounge off the House floor smoke-free, which will greatly aid those like Rep. Oxford, who is a highly smoke-sensitive asthmatic. But the bottom line is: Big Tobacco has again prevailed in the State Capitol and this will likely lead to more smoking in members’ offices, not less. Wherever it occurs in the Capitol, smoking pollutes the air everyone must breathe. Just opening a window in a House member’s office will not eliminate the secondhand tobacco smoke. Representatives who worked so hard on this – particularly Jeanette Mott Oxford, Jill Schupp, and new members Rory Ellinger and Carla May – deserve our gratitude. By contrast, although Speaker Steven Tilley and Majority Floor Leader Timothy Jones allowed Rep. Oxford to offer her amendment and not kill it, the Republican leadership deserves censure for evidently discouraging their members from voting their preference on this important issue. That is not how democracy is supposed to work, especially when it comes to an issue of public health and welfare, on which government should take the lead. Please click image above to enlarge. UPDATE: At the request of Republican leaders, the full House today defeated an amendment to ban smoking in legislators’ offices. The vote was 113-45. JEFFERSON CITY • Smoke-free is becoming the norm in workplaces across Missouri. But in state government, you can still light up in one office building: the Capitol. The House and Senate allow smoking in representatives’ and senators’ office suites on all four floors of the Capitol, as well as in a members-only gallery at the rear of the third-floor House chamber. Now, that policy is coming under attack from health-conscious legislators in both political parties. They say they’re standing up for children in tour groups and people with asthma and other respiratory problems who can’t breathe in smoky spaces. Those pushing to bar smoking have wrung one concession from Republican House leaders, who agreed to ban it in the rear gallery, where legislators often grab meals between votes. But the House Rules Committee has so far rejected pitches to go further. With the Legislature sometimes working 14-hour days, opponents of a smoking ban say it would impose a hardship on legislators and staffers who smoke. “I don’t think there was a consensus … to take away people’s individual prerogative to do something in the privacy of their offices,” said the committee’s chairman, Rep. John Diehl, R-Town and Country. Some Democrats will try to reverse that decision when the House debates the rules, possibly as early as today. Across the Rotunda, the Senate has already banned smoking in its rear gallery, as well as common areas such as committee rooms, hallways, restrooms and elevators. But senators, too, can smoke in their offices. No members have proposed to change that. Areas of the Capitol controlled by the executive branch — parts of the first and second floors — do bar smoking. The issue is coming up in the House, in part, because legislators in the minority party (Democrats) are crammed into small cubicles, which are double-decked on the Capitol’s high-ceilinged first floor. With no seniority, Ellinger, for example, ended up in what’s known as the ‘smoking complex,” where at least two of the 10 legislators smoke. So do some staffers. The offices share a ventilation system. “Someone can confine their smoking to their cubicle but the smoke goes everywhere,” said Rep. Jeanette Mott Oxford, D-St. Louis. Smokers say the problem is overstated. Rep. Tim Meadows, D-Imperial, said that when he smokes, he closes his office door, opens the window and turns on a fan. “We blow it outside,” he said. Meadows said he is trying to quit and hasn’t had a cigarette in eight days. But even if he quits for good, he supports letting lawmakers smoke in their offices. Rep. David Sater, R-Cassville, who persuaded the House Republican Caucus to prohibit smoking in the rear gallery, said that with the House’s odd hours, a broader ban would impose “a hardship” on smokers. Some remember when the problem was much worse. As late as the 1990s, smoking was allowed throughout the Capitol, including in the ornate House and Senate chambers and in packed committee rooms. “Fifteen years ago, the majority (of legislators) were smokers,” said Sen. Tim Green, D-Spanish Lake. Also, growing concern about the danger of secondhand smoke has galvanized support for measures banning smoking in public places. Jefferson City voters passed such a measure in November, though it doesn’t govern goings-on in the Capitol. But the culture is changing. While the resolution had no force of law, Britton used to puff away in a third-floor hallway corner. He’s more careful these days. On Wednesday, Britton was spotted walking down the hall with an unlit cigarette in his hand, heading for a friendly Senate office. “I just try to be discreet with my smoking,” he said. Posted in Govt-and-politics, Missouri on Thursday, January 13, 2011 11:30 am Updated: 2:54 pm. The state’s motto itself explains how the anti-freedom, anti-smokers take away rights under the guise of taking care of everyone. Much like keeping more people on welfare attempts to control their behavior. The “welfare” of this nation does NOT mean to control their behavior. The welfare of this nation that our founders meant was to protect her citizen’s liberty AT ALL COST!